You can add camping to the growing list of things that just aren’t like they used to be. In parks and campgrounds the traditional routine of lugging equipment, pitching a tent, gathering firewood, and crawling into a sleeping bag is changing—and the new approach to roughing it is called glamping. Glamping is a label fashioned from the words glamorous and camping—a term so new it just appeared in the Merriam-Webster dictionary last year. It’s all about having a real bed, a hot shower, and a flush toilet while still being immersed in nature. The number of glamping accommodations offered on booking platforms has skyrocketed in the past five years. After starting in 2014, the Glamping Hub (glampinghub.com) listed 20,000 properties by the end of 2017 and has reached 34,000 currently. Those range from kitchenette-equipped tipis in California for $140 per night to secluded two-bedroom one-bath tree houses in Georgia’s Appalachian Mountains for $308. The front porch of an oTENTiks glamping unit near Banff, Alberta, provides a great place for travelers Terry Ramsey (left) and Elisa Schwaiger to relax. Camping comfort. 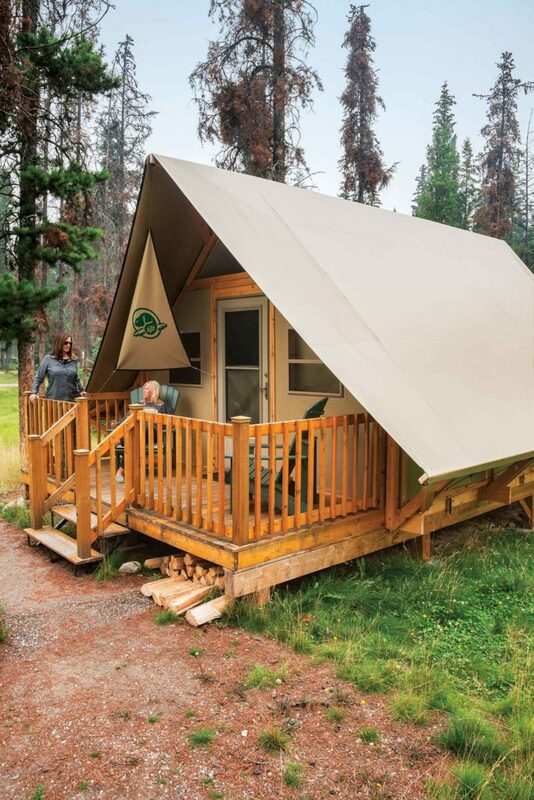 Parks Canada has bought into the glamping movement with more than 400 oTENTiks units—an A-frame cross between a prospector’s tent and a rustic cabin. Equipped with raised wood floors, beds for six, solar powered lights, electric heat and more, the units (left) are helping to bridge camping’s generational gap. Now in it’s third year, records show bookings for these facilities­—which rent for around $120 per night—are running 150% higher than traditional camp sites. Greg Hovdebo, who’s camped and back-packed for years in the Canadian Rockies, decided glamping was a better way to share his love of the outdoors with his wife Charissa and seven year-old daughter Brinn. “We typically take one big trip each summer and after abandoning my pop-up tent I’ve decided that I don’t ever want to sleep on the ground again,” says the Calgary, Alberta, native. The Parks Canada glamping system also includes yurts—a modern take on the traditional dwellings of central Asian nomads—and tipis. Jenn Oberowsky, from Edmonton, Alberta, was proud of her history ‘roughing it’ as a traditional camper before experiencing glamping’s comfort. “Last summer we stayed in a tipi with beds, a heater, and a wood floor. It was basically like a hotel room, but being out in nature made it a lot more fun. It was a great family experience and would be a wonderful way for a beginner to get started camping,” she says. Unique options. Glamping comes in many forms, from the tents, tipis, and yurts shown here to Conestoga wagons equipped with king and twin beds, electric outlets, and wi-fi (zionponderosa.com). The exotic safari tents used by wealthy 19th century adventurers in Africa were the inspiration for eight high-end glamping resorts established by Sarah and Jacob Dusek of Under Canvas (undercanvas.com). The resorts, located near national parks in the mountain west and southeast, feature a private bathroom, plush king-size bed, a wood burning stove, and daily housekeeping. 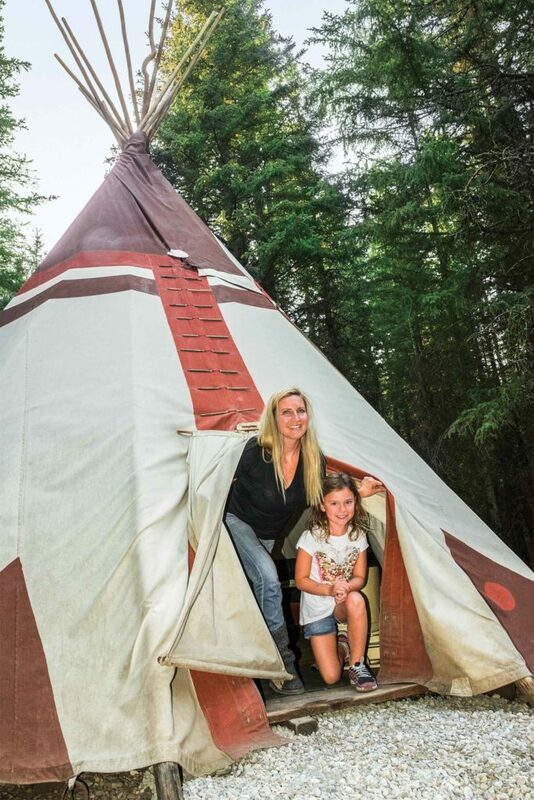 Jenn Oborowsky, and daughter Elle, found glamping in a tipi to be a fun family experience. In Denison, Texas, glamping innovator Mark Lenard has even taken luxury camping a step further. “People tell us where they want to camp and we’ll set up their campsite with one of our glamping tents that are equipped with a queen bed, linens, towels, furniture and a power generator. We’ll even arrange for their meals to be prepared,” says Lenard, who operates IGlamp (iglamp.net) in the popular tourist region around Lake Texoma. “We get a lot of interest from apartment and condo dwellers who have no room for camping equipment and from families or other groups who want to have a special weekend outdoors but don’t want the hassle of setting up and tearing down a campsite. We make it so all they have to bring is their ice chest,” says Lenard. The Yurts at Green Acres (above) are decorated in southwestern style, sit on a raised deck, feature queen or twin beds, and rent from $100 to $175. How two young farmers got their start.